New Delhi: Indoor air pollution is a big problem, irrespective of the season. Inside your home are a combination of air-polluting sources such as gas, coal and wood, outdoor pollutants, smoking and household cleaning products—all of these have in some way been linked to respiratory disease, stroke and cancer. If you use an air purifier in your rooms, the unclean air will be run through a series of filters, which will capture dust, viruses and bacteria, particles unseen to the eye, volatile organic compounds, gases, pet dander, allergens, smoke, paint fumes and more—and what you will get instead is clean air to breathe. 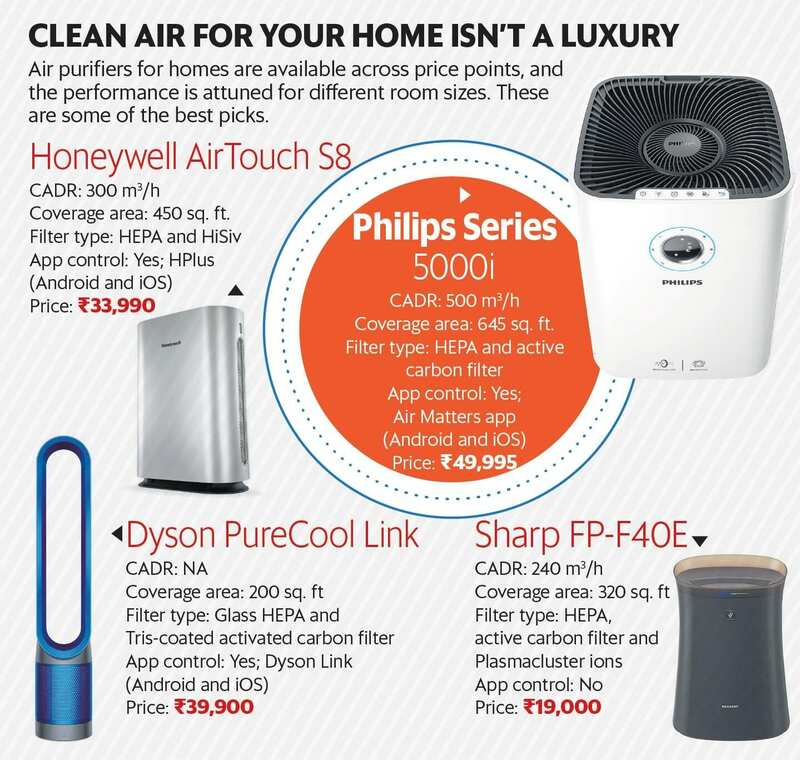 Design: The Philips Series 5000i purifier (₹49,995) and the 3000 series 2-in-one purifier (₹37,995) provide a breath of fresh air with their looks. The Series 5000i, the AC5659/20 variant to be specific, is quite compact and has a square design . There are air intake vents on either side, which means it can take in a lot of unclean air at the same time, and run that through two pairs of filters. The 3000 series has a more conventional vertical design, but its highlight is the humidifier feature that would be handy for anyone who suffers from discomfort or throat ailments because of dry air. Philips has added four wheels underneath the Series 5000i and Series 3000 air purifiers, which makes it a breeze to move these around and also for regular cleaning. The Series 5000i is a smart purifier, which means it can connect to your home Wi-Fi and relay data to your phone. The Air Matters app (free for Android and iOS) will show you data such as the present purifier mode, detailed air quality stats, filter life and ability to control all features of the purifier while sitting anywhere in the world. Performance: The Series 5000i is meant for large rooms and has a powerful 500m3/h clean air delivery rate (CADR). It also has a gas sensor to detect and eliminate harmful gases such as toluene, VOC, and odours. This is ideal for large hall spaces, and it maintains excellent air quality even if there is activity in the same space. The Series 3000 has a powerful 310m3/h CADR, which means it is perfect for living rooms, dining rooms and even large bedrooms. Both purifiers run silently for the most part, and you will notice the fan speeds only at the highest setting—the auto mode will push it that much only if it detects poor air in the room. While the Series 3000 doesn’t come with a Wi-Fi option, it does offer a built-in humidifier that can be handy in regions where the air is dry. This can add as much as 600ml of humidification per hour into the room’s air, which could help deal with a lot of regular throat ailments.